I had obtained a nice looking feather design from someplace ... I don't remember the website and had not recorded where it was at the time I downloaded it. I almost wish I had .... just so I could avoid it in the future. The test stitch out was horrid. I mean AWFUL: great, galloping stitches emanating from the spine .. they would catch on EVERYTHING. However, I did like the overall look of the feather, so I thought I could "fix" it with my minimal editing skills in Embird. After a very long time at the keyboard, I was able to transform all the LONG, LOOSE stitches into nice, flat, running stitches. Unfortunately, my skills were not sufficient at that time to create a realistic, curved feather look .. BUT ..it was a heck of a lot better than the freebie! I combined 2 of feathers into one design and stitched them descending from the shoulder to the top of the pocket on my Levi work shirt. They looked adequate but not spectacular. I'm not even going to show them here but they piqued my interest in feathers. 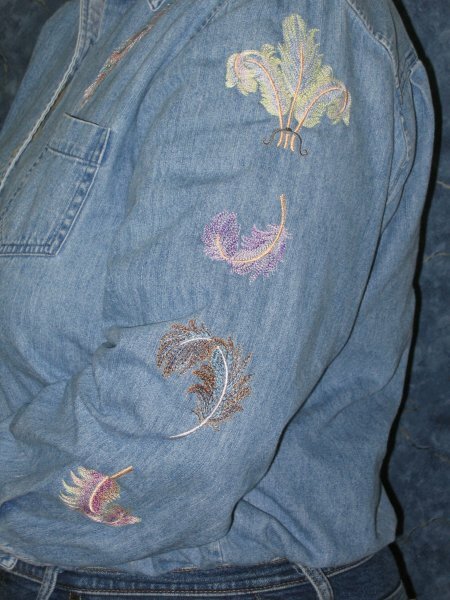 During one of my frequent Internet surfing forays, I found a link to Needle Passion Embroidery's Feather collection. OH. MY. GOODNESS. *This* is what digitizing is all about! This set of 15 feathers is drop-dead gorgeous, so I bought it. The set soon arrived via email and stitches out beautifully, as the picture shows. The only difficulty is deciding which ones to use and what threads to use! I eventually chose four and cascaded them down my left sleeve. Since I am color-challenged, I kept with the digitizer's color choices. I wasn't disappointed; I receive compliments on my shirt whenever I wear it. In order to actually stitch the designs on the sleeve, I did open up the sleeve seam from underarm to cuff, stitch the feathers,then re-sew the seam. It wasn't terribly difficult.